One question I'm often asked about stationery is how to apply it to replies and forwards. This is not possible using native Outlook features, as Outlook uses the same format for replies and forwards that was used in the original message. You can insert stationery into a reply in the reading pane. The HTML file can include background colors and any images must be in the code using the full path to the image. Because the theme is inserted into the file, your cursor may be 'invisible' when you type. It eventually comes back but if you are in a hurry to see the flashing cursor, you can save and reopen the message. This code uses the Scripting Runtime to read the HTML file. You'll need to set a reference to it in the VB Editor's Tools, References dialog. Do you want to create new messages using a specific stationery without using the More Stationery dialog? See Insert an HTML file or Stationery into a New Message. To use this macro, add the code to the VB Editor and edit the file name. Open a new message and create a button on the ribbon for this macro. When you want to use the stationery, click the button. While you can set the stationery automatically when you click reply, the messages may be messy and difficult to read. If you want to automatically apply the stationery, VBA Sample: Do something when Reply is clicked shows how to 'do something'. You'll need to put it together with this code. strFile = enviro & "\AppData\Roaming\Microsoft\Stationery\compass.htm"
This code goes in ThisOutlookSession. strFile = enviro & "\AppData\Roaming\Microsoft\Stationery\pawprint.htm"
Office uses several locations for stationery files. C:\Users\username\AppData\Roaming\Microsoft\Stationery. You can open this folder by typing %appdata%\microsoft\stationery in the address bar of Windows Explorer and pressing Enter. 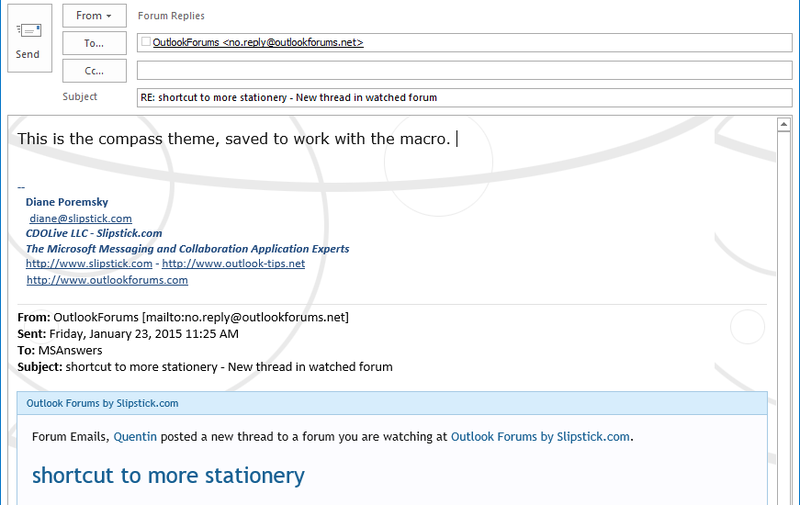 You can copy your custom stationery to this location so it's accessible using the macro or using the Stationery picker. If you want to use one of the default stationeries with this macro, you'll need to edit the image filepath. I recommend copying the HTML file and background image to the user's stationery folder before editing the image filepath. Can I use my own stationery in replies?